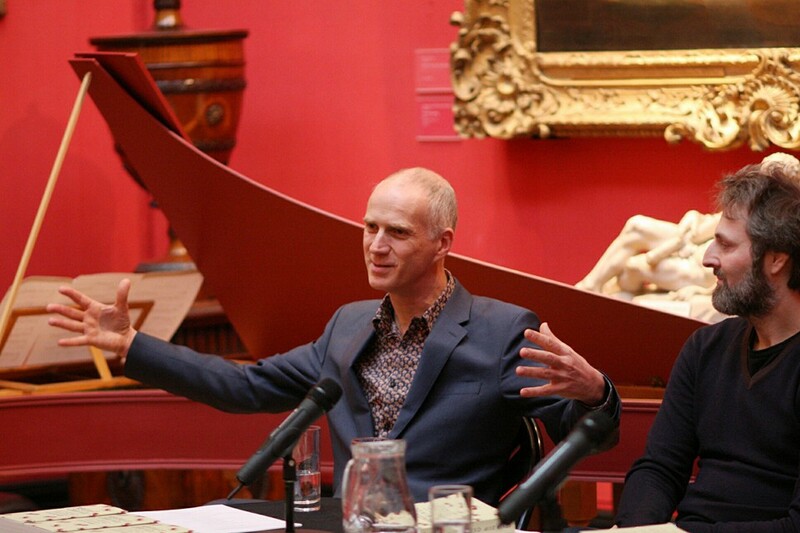 To the Fitzwilliam Museum, Cambridge, on April 28, for the launch of Tregian’s Ground by Anne Cuneo, co-translated with Roland Glasser and published this spring by And Other Stories. 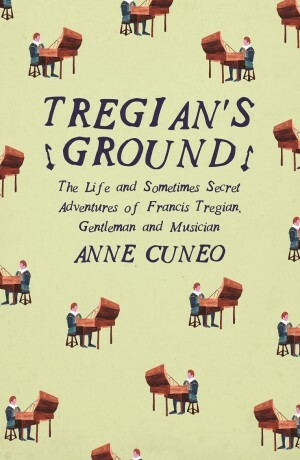 Already hailed on Twitter as ‘Wolf Hall with harpsichords’, Tregian’s Ground is the fictional memoir of its not-at-all fictional hero Francis Tregian, the ‘gentleman and musician’ of the book’s sub-title. Francis was a Cornish recusant, persecuted under Elizabeth I and generally thought to have died in the Fleet prison, though Anne has him living incognito, and in exile, in Switzerland, where he takes it upon himself to set down the story of his colourful ‘life and sometimes secret adventures’. 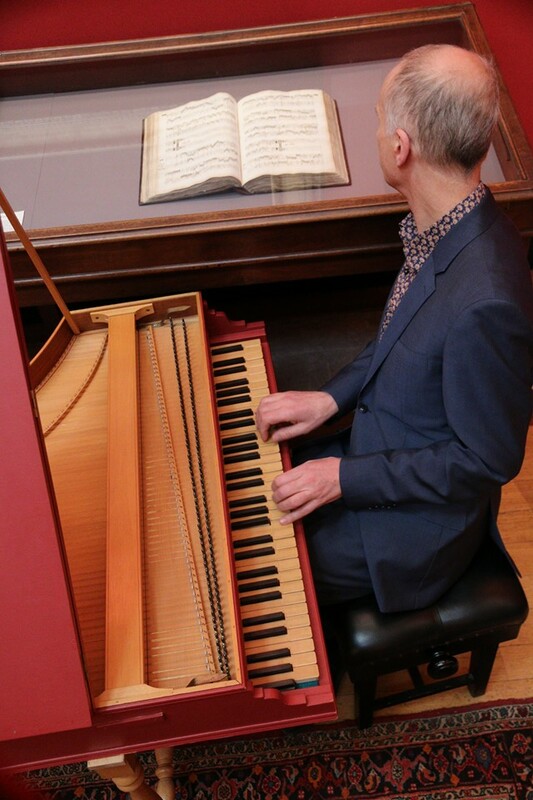 Tregian has been identified by Anne and others as the compiler and scribe of the celebrated Fitzwilliam Virginal Book, an important compendium of early keyboard scores in the collections of the Fitzwilliam Museum. And while scholarly debate continues to rage on the subject (doubtless with all the swashbuckling panache of Anne’s novel – ‘Have at you, Sir!’, ‘On guard!’), we felt duty bound to side with our author, and to celebrate the long-awaited English translation of her 1993 best-seller at the home of the Virginal Book itself. Francis’s life and sometimes secret adventures are full of encounters with the great and good of his day – English musicians Thomas Morley, William Byrd and Giles Farnaby, Elizabeth I, Cardinal Allen, Henry Wriotheseley (Earl of Southampton, the putative ‘onlie begetter’ of Shakespeare’s sonnets), even Shakespeare himself. Appropriately enough, we spotted a huge, glittering portrait of the Virgin Queen gracing one wall of the gallery, opposite the Virginal Book in its vitrine. 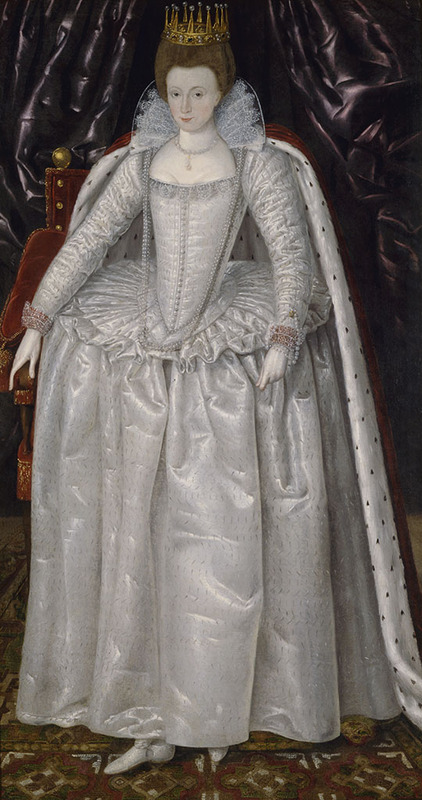 Elizabeth Vernon, Countess of Southampton. British School. Oil on canvas, height 188 cm, width 109 cm, circa 1603. I had never heard so much gossip in all my life [as here in London]. Utter strangers would take you aside in a window-seat and cheerfully review the entire assembled company, and much of the rest of society, too. I prefer not to imagine what was said about me. I had heard rumours to the effect that the young Earl might prefer men himself. I had seen him retire with a young woman, and with a young man, too. I did not know what to think. From the way Henry framed his question, I understood: he was testing the terrain, with great delicacy. His personal beauty was indeed troubling. Even I felt it, who have never had a taste for men. And his openness and generosity in every gesture, every smile, his apparent purity of heart, despite the occasional flash of cunning, his ready accessibility to all, conferred on him an irresistible charm. Even Shakespeare, that indefatigable ladies’ man, had succumbed to it. This angelic youth invited confidences, an innocent smile playing at his lips, and I fought hard not to tell him everything. But I had to cut short the gossip and supposition. ‘You can depend on me,’ he said, with a bow. I’m not sure he believed me. ‘And you?’ I asked, as if to return Wriothesley’s polite interest. We barely notice the fading light, and then we have no desire to take our leave.The Morleys’ lackey runs to fetch Jack, my valet, who is waiting for me at The Bear nearby, and he takes our excuses to the Southamptons and Farnabys. We part at first light, having sung and played all the night through. I note down the pieces written by my two friends and those by their best- loved composers – Bull, Dowland, Ferrabosco and others – and leave with my pockets stuffed full of music. I reach the courtyard of Southampton House at dawn, cheerful and dishevelled, dragging my valet behind me like a man walking in his sleep. I find Henry awake. ‘Ah, I knew you would succumb to the charms of an English lady, sooner or later!’ he says, laughing out loud. ‘Or was it an English man?’ he adds quietly, with a wink. ‘Two English ladies by the name of Euterpe and Terpsichore,’ I inform him. And without waiting for a reply, I climb the two flights of stairs to bed, with my valet at my heels. Trotting down the Fitzwilliam’s monumental staircase at the end of our afternoon in the company of Francis, Morley, Farnaby et al., we felt every bit as cheerful. Our valets weren’t at our heels, but I trust Anne was with us in spirit. 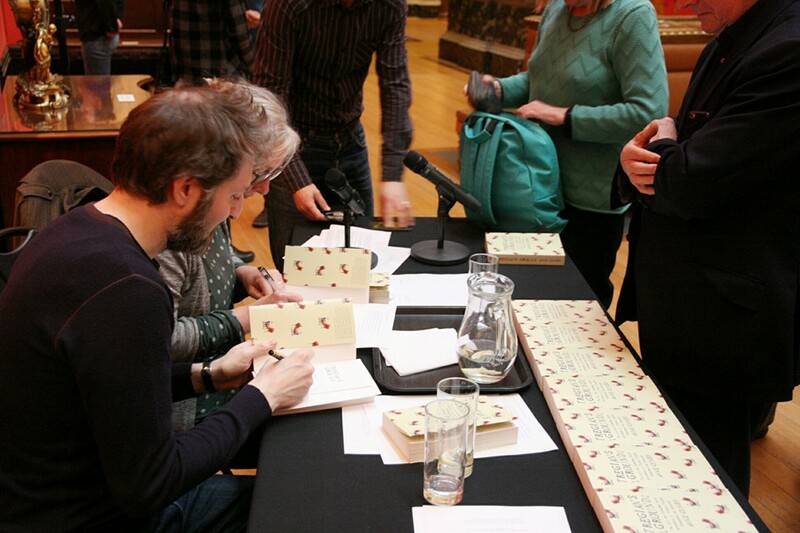 With thanks to our translator colleague Martin Cassell for his photographs of the event. Elizabeth Vernon, Countess of Southampton, © The Fitzwilliam Museum, Cambridge. This entry was posted in Art & artists, Literature, Literature in translation, Translation and tagged And Other Stories, Anne Cuneo, Fitzwilliam Virginal Book, Francis Tregian, Giles Farnaby, Henry Wriothesley, recusant, Thomas Morley, William Byrd. Louise, I loved ‘Tregian’s Ground.’ The feel of the novel and the ‘voice ‘ are spot on…or what I imagine to be so for that period. Great work by yourself and Roland, and I can’t see the join. Brilliant collaboration on what is a triumph of translation. Chapeau! Thanks so much, Lesley! Really glad you enjoyed the book.